Showing results for tags 'carved clay'. Wheel thrown with underglaze decoration, paper resist, and sgraffito. Carved texture and pulled handle. 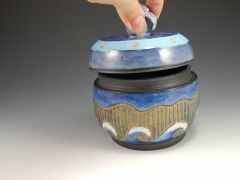 This is a jar I threw in one piece, incised the lid then trimmed them apart. 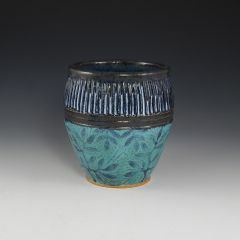 The whole piece is covered in various engobes and underglazes, carved and fired in an electric kiln. Thrown tumbler with leaves slip decoration. 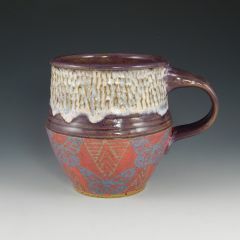 The top is hand carved, and it's glazed in 3 commercial glazes and fired in my electric kiln to cone 6.